The UK government has approved trials of semi-autonomous lorries, running in connected ‘platoon’ convoys, on public roads. Tests are set to begin in 2018, in conjunction with operator DHL. Goods will be transported in lorries built by DAF Trucks, using autonomous driving technology developed by engineering firm Ricardo. 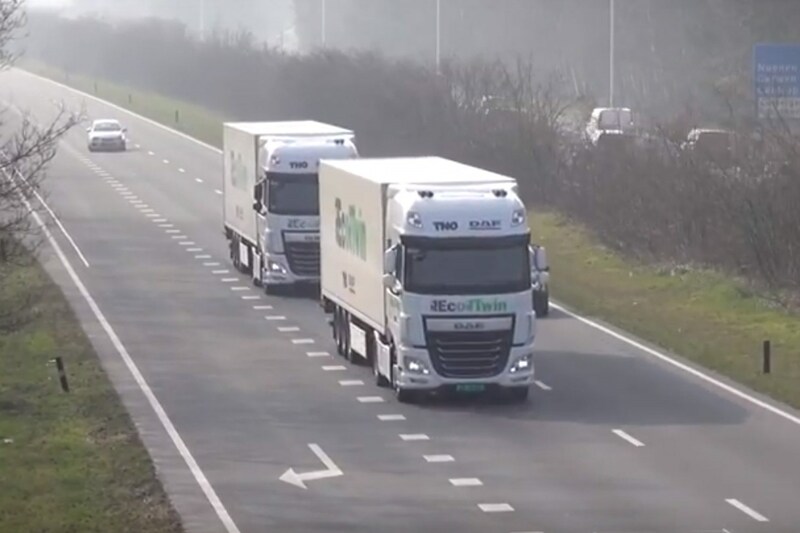 The platooning trials will involve two to three lorries running together in close proximity, with the lead vehicle dictating the pace. The lead driver effectively controls the trucks behind – when the head lorry slows down or accelerates, the coupled vehicles behind simultaneously follow suit. The trucks are connected to one another by wi-fi and communicate with their own local network. Human drivers will be present on board at all times during the trial, to take over manual control when required. Running closer together enables the slipstreaming lorries to save fuel and reduce emissions, as well as potentially reducing congestion by taking up less physical space on the road. ‘Platooning could be an innovative means of reducing fuel use so saving costs and reducing carbon and air quality emissions,’ said the Freight Transport Association’s head of policy Christopher Snelling. ‘Driving closely together, platoons of trucks take up less space on the road, and travelling at constant speeds can help improve traffic flows and reduce tailbacks. In association with the Department for Transport (DfT) and Highways England, the trials are being organised and conducted by the Transport Research Laboratory (TRL), an automotive innovation agency originally established within the British government but privatised in 1996. The government is reportedly investing £8.1m to assist with funding the trials, which will initially involve tests on closed tracks and in simulations, before being conducted in the real world on yet-to-be-determined stretches of UK dual carriageways. A desire to run such a trial has been expressed by the UK government since 2014. Similar projects have been carried out in Europe in 2016, with Volvo and Daimler engaging in long-distance platooning tests. Concerns have been raised that the lines of platooning HGVs could obscure other drivers’ vision of slip roads and signs, especially on ‘smart’ motorways with traffic running in the hard shoulder lane. Road safety charity IAM RoadSmart has asked for reassurance on the vehicles’ vulnerability to cyber attacks. ‘The public quite rightly have real concerns in the light of current terrorist attacks and the rise in cybercrime generally. These are all genuine questions in people’s minds that need to be answered by the trial,’ said the charity’s director of policy and research Neil Greig. The charity has also expressed a request for further information on how civilian road users will be made aware which trucks are part of a platoon. ‘Motorways are our safest roads and that record must not be jeopardised by any rush towards autonomous technology. The pilot study may answer these questions but car and motorbike users will need a lot of reassurance that the systems will not block the inside lane with an extra-long “wall” of trucks,’ said Greig.